Mini Dehumidifiers to keep enclosed areas dry and mould free. Mini Dehumidifiers – the PINGI difference! There are many reasons for people to consider buying mini dehumidifiers. You may have a minor issue with a damp cupboard or just a bit of occasional condensation on the windows. Small dehumidifiers are also popular in confined storage areas or in places like cars, boats or caravans. Mini dehumidifiers take up far less space. Small dehumidifiers are of course also much cheaper than commercial size or large dehumidifiers. 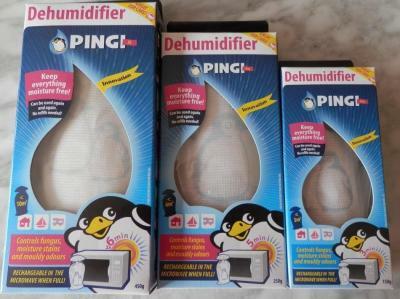 Our PINGI range of mini dehumidifiers are not electric. Silica Gel pellets inside our products absorb the humidity until saturation point has been reached. You are then able to place the bag in the sun or in a microwave oven to dry it out and release the moisture. Our Products page has complete information on the PINGI range. In some rooms or properties there is a need for moisture control on a more serious level. Bedrooms on a lower level of a sloping property sometimes have damp issues where you may want to combine a large electrical dehumidifier with some of our small dehumidifiers to get the best dehumidification results. In this instance the larger dehumidifier is positioned in the main part of the room and the PINGI products inside wardrobes or cupboards. So what makes our products special? The small dehumidifiers require no electricity. No refills – our products are much cheaper in the long run. Our 1 year warranty confirms that we are confident that our products will perform well. A dehumidifier for every challenge. Want the best small dehumidifiers available? Go to our Shop and place your order today!